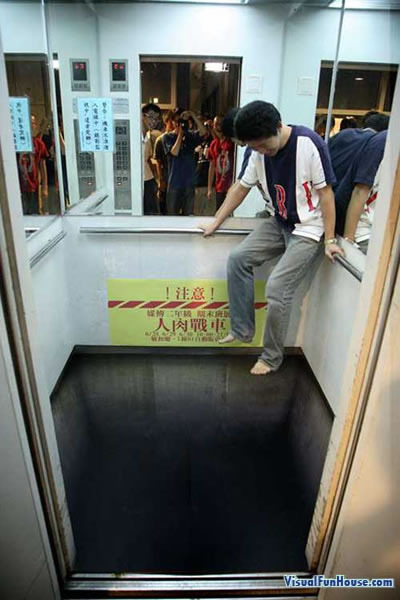 The Elevator Optical Illusion would be one freaky ride, the floor drops down as far as the eye can see. Much like the Drop of Doom Ride in Disneyland except you wont go screaming down when you get in. This is actually a 3D Chalk Drawing, in which the artist has painted the floor as if it just drops down into a bottomless pit. 3D chalk drawings are amazing illusions, that create incredible optical illusions when views at the correct angle. Also be sure to check out some of the work from Julian Beever, he is very well known for his awesome chalk drawings. I would be afraid to stand on it!